Maria of Habsburg, Queen consort of Hungary and Bohemia and regent of the Netherlands (Governor of the Seventeen Provinces) from 1530 until 1555; born 18 September 1505, a daughter of Philip I of Castile (son of Emperor Maximilian I) and Joanna of Castile. She married Louis II, King of Hungary and Bohemia (1506-1526) in 1522, who fell in the battle of Mohacs in 1526. After the death of her aunt, Margaret of Austria, in 1530, Maria's brother Emperor Charles V arranged to have her become regent of the Netherlands, governing in his name. Maria died 18 October 1558 and was succeeded as regent by Emmanuel Philibert, Duke of Savoy (1528-1580). It was during her reign that the Anabaptist movement arose in the Netherlands and its severe persecution was instituted. 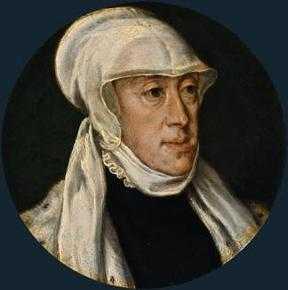 She is described as a very capable woman, who was at first not hostile to the Reformation. At the death of her husband she received a letter of condolence from Luther. Melanchthon was personally acquainted with her. In 1539 Pope Paul III accused her of "Lutheranism." Nevertheless she always complied with the wishes of her brother throughout her official life. A number of persecution orders were issued, and inquisitors searched the country. The Anabaptists especially suffered relentless persecution; the order of 1535 referred primarily to them. When the Dutch court, inclined to lenience, asked the regent for instructions, she ordered the death of all the victims. Doopsgezinde Bijdragen (1906): 21-23, 29. Hege, Christian and Christian Neff. Mennonitisches Lexikon, 4 vols. Frankfurt & Weierhof: Hege; Karlsruhe: Schneider, 1913-1967: v. III, 36. Zijpp, Nanne van der and Richard D. Thiessen. "Maria of Habsburg, Regent of the Netherlands (1505-1558)." Global Anabaptist Mennonite Encyclopedia Online. December 2007. Web. 26 Apr 2019. http://gameo.org/index.php?title=Maria_of_Habsburg,_Regent_of_the_Netherlands_(1505-1558)&oldid=145843. Zijpp, Nanne van der and Richard D. Thiessen. (December 2007). Maria of Habsburg, Regent of the Netherlands (1505-1558). Global Anabaptist Mennonite Encyclopedia Online. Retrieved 26 April 2019, from http://gameo.org/index.php?title=Maria_of_Habsburg,_Regent_of_the_Netherlands_(1505-1558)&oldid=145843. Adapted by permission of Herald Press, Harrisonburg, Virginia, from Mennonite Encyclopedia, Vol. 3, pp. 479-480. All rights reserved. This page was last modified on 16 January 2017, at 00:52.